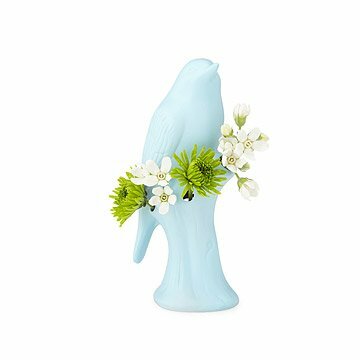 Perched on a spray of your favorite florals, this winged beauty breathes life into any part of your home. Perched on a seasonal bouquet of your own design, this winged beauty breathes life into any part of your home. A hole hidden at the bird's back allows you to fill the vase up with water to keep the gathering of buds at her breast fresh. Available in baby blue or classic white to complement your favorite floral spray. Made in China. Porcelain Bird Vases have a matte and textured finish. As others have commented, this vase is unglazed. I would not have purchased it, had I known it was unglazed. "Matte finish" isn't really an appropriate descriptor. There are matte finish glazes and this vase literally looks like one that is getting ready to be fired with glaze. It looks "unfinished". That being said, it was on sale and I am going to attempt to give it a little shine with some kind of spray finish as one other customer mentioned. Since both it and the blue version are sold out, it was clearly a big seller. If you re-stock, I would recommend a better description. This product was a little bit bigger than I thought and as mentioned several times had a matte finish which made it look somewhat cheaper ( I also did not read the fine print when purchasing). Easily fixed, I bought a can of inexpensive gloss spray from hardware store and sprayed lightly. It gives it a much more polished and finished look. As I bought six of these I am super pleased! At first I was hoping it to find a smaller version of this for a bookshelf - but if it were any smaller, you'd have to fill it twice a day with water, so this is sized right - slightly smaller than a real robin. Looks great on the windowsill. The design is sweet and balanced - the finish is matte for both colors - available in a glossy version elsewhere for twice the price. There was a bump of glaze on one of the white birds but I was able to smooth it easily and without detection with an emery board. I'm very happy that I found these on sale! This vase is larger than I expected. I gave the recipient a variety of silk flowers (she lives in a nursing home) so she can change them out quickly when she wants a different look. She loves it! I bought two of these vases and kept one for myself at Christmas. I have had so many compliments that I'm back for two more. We live in the desert and often my husband will stop his car and bring home 3-4 blooms to enjoy indoors. I add a bit of greenery and it is brilliant. I am also a grandmother to nine little angels and grandma's know how important it is to display the handful of scrunched up flowers the children bring thru the door. This vase is perfect for pleasing the little ones and encouraging the spirit of giving. This was a gift for my grandmothers birthday. It was so beautiful and she absolutely loved it. My grandfather always picks flowers from their garden for her and this was a beautiful way to display them. I went with the baby blue vase. Everyone couldn't believe how realistic the bird looked. It was very pretty. For artificial flowers until real flowers are ready in WI. I ordered 2 of these, the blue one and the white. I received both in good shape but not painted and not glazed. Purchased as a gift for my sister, who grows a lot of flowers and loves to arrange and display them. she was delighted. The texture of the vase is rough and rustic rather than smooth, she didn't mind that at all and was pleased with the unusual nature of the vase. The item was much taller than i imagined, which is ok really and I didnt pay mind to dimensions upon ordering, so my fault. The finish is matte almost like their is no glaze or clear coat on it. This to me,made it look less expensive than it was. I havent seen it with flowers in it yet so hopefully this will help liven it up.